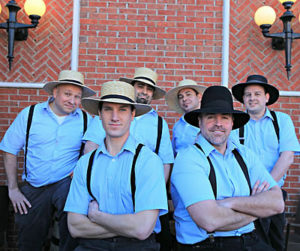 It’s not every day you can dance along to the sounds of a bunch of Amish men singing Lady Gaga or rapping a Jay Z song. But that’s exactly what can happen if you see the Amish Outlaws during Rock at the Row on Thursday (August 7). The group has its full story on its website, chronicling how it all started with some of the original members meeting after “Rumspringa.” That’s the Amish practice of letting 16-year-old children live without the Amish code of conduct to decide if they want to be baptized into the church. Although most youths return to the Amish lifestyle after Rumspringa, the guys from The Amish Outlaws did not. The performance takes place from 7:00-9:00 p.m. at Pentagon Row on Thursday.